We LOVE Andy’s! My husband goes hunting up in this area and we are sure to stop at Andy’s for everything we need (e.g., gas) or want (e.g., coffee fix, pizza from the stone oven, homemade apple pie ala mode). The service is a little slow but it’s a small town and we actually enjoy the slower paced life when we’re there. So set your cell phones down, order up a delicious lunch, and enjoy the people and scenery around you. The coffee is great, the prices aren’t too shabby, the food is great and we love supporting local businesses. Stop by! Normally I don’t yelp gas stations, but this one is a bit exceptional in that it’s a good spot to get local info and has 2 cafe’s attached to it. What a find! We stopped here at the Service Station/Heavenly Grounds Espresso after climbing Mount Adams on the way back to Seattle. 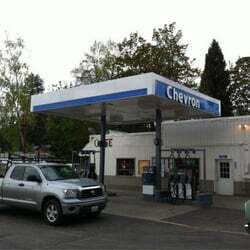 This place is family owned, and includes a gas station and two restaurants. We gassed up, and the husband/father told us about the back road towards Seattle that saved us at least 2 hours by bypassing going through Portland. He patiently explained all the turns we would need to take. The burgers and espresso drinks were great, and although we didn’t have any, the huckleberry pie looked awesome… next time! The husband, wife, teenage kids and workers were all super nice. Just what we needed upon our return to civilization. Thanks for the great experience!